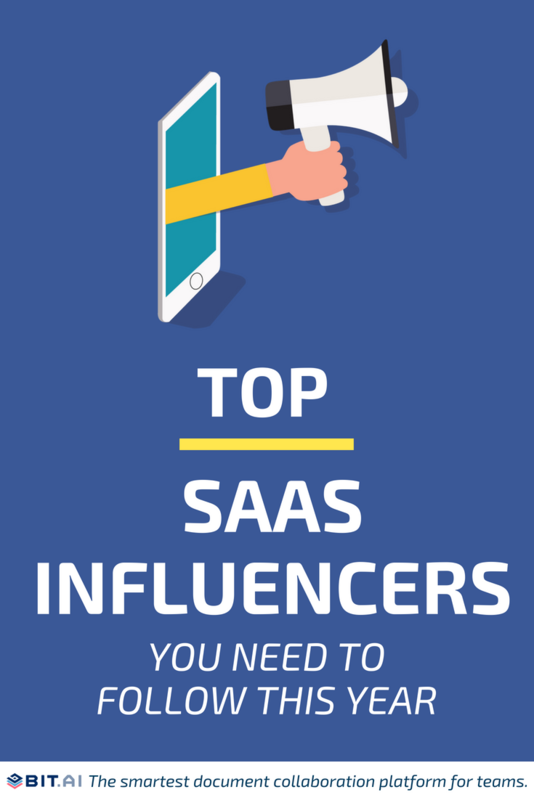 Let’s take a look at some of the top SaaS Influencers on the market today who share the latest and greatest in the software world. Software-as-a-Service or SaaS has increasingly become a leading distribution model for software in today’s digital world. The SaaS model has made the creation and distribution of software so much easier, making software more accessible than ever before. Leveraging the cloud, SaaS has pioneered the way we access and use modern-day software. Instead of installing and maintaining software, one can easily access it using the Internet, free from complex software and hardware installation. As Software-as-a-Service becomes a household name, it’s important to note who provides SaaS advice, as well as perspective on the latest trends. The world of SaaS has changed from complex cloud apps to modern day hip tools that are changing the way we work. As SaaS evolves, it’s important to keep up-to-date with up-and-coming trends to gain a competitive advantage, as well as form relations with people leading this evolution. This is why we have created a list of some of the best known SaaS influencers out there. What works and what doesn’t work based on research and in some cases experience. Insights from top industry leaders and SaaS businesses. They each have their own voice, style, and online presence. If you’re in the SaaS space, have an interest in working or creating a product in the space we highly recommend that you follow these SaaS influencers. Dharmesh Shah is the current co-founder and CTO of inbound marketing behemoth HubSpot. Yep, that’s a public company! His first startup, Pyramid Digital Solutions, launched in 1994 when Shah was 24 years old. Talk about decades of experience. After bootstrapping it with less than $10,000, he sold it for millions to SunGard Data Systems. In 2006, Shah was named an Inc. Founders 40. He is an active member of the Boston-area entrepreneurial community, an angel investor in over 60 startups, and a frequent speaker on startups and inbound marketing. Look out for him on the speaker circuit. Dharmesh founded and somehow makes time to write for OnStartups.com – a community with a whopping 500,000 members! The most underrated skill in business and in life is empathy. The second most underrated skill is gratitude. If you are SaaS enthusiast, you must have heard of Hiten Shah. Founder of CrazyEgg, KISSmetrics, Quick Sprout, ProductHabits, GetDraftsend and more, Hiten is a SaaS veteran, building and helping others build great SaaS companies. Hiten also has an email newsletter called SaaS Weekly where he shares the best links of the week for anyone interested in SaaS businesses. A top-of-the-line SaaS influencer we must say! Creativity tends to make the difference between the impossible and possible. Creativity unleashes endless possibilities. One of the biggest SaaS influencers on this list, Jason Lemkin started the world’s largest community for SaaS/B2B founders, SaaStr.com (which reaches almost 500,000 followers with over 2M views per month), and the world’s largest gathering for them, SaaStrAnnual.com. Forbes named SaaStr as one of the Top 100 blogs for entrepreneurs, and Inc. Magazine named SaaStr one of The 50 Best Websites for Entrepreneurs. Apart from running SaaStr, he is a top-notch VC (see: SaaStrFund.com) and has been the first or very early investor in many leading enterprise/SaaS start-ups, including Algolia, PipeDrive, Marketo, Automile, Talkdesk, Parklet, Greenhouse, Mixmax, Pipedrive, Rainforest QA, Logikcull, SalesLoft, and more. He also co-founded and served as CEO of EchoSign, the web’s most popular electronic signature service, which was acquired by Adobe! Oh, and btw, Jason’s Twitter is full of gems like these. Do give him a follow for some real-life advice for anyone in the SaaS or startup world. Neil Patel definitely deserves a mention while discussing SaaS influencers. One of the biggest names in the world of online marketing, Neil has co-founded four multi-million dollar software companies (Crazy Egg, Hello Bar, Kissmetrics & Quicksprout). Forbes has listed Neil as one of the top 10 marketers, and The Wall Street Journal calls him a top influencer on the web. Neil was recognized as a top 100 entrepreneur under the age of 30 by President Obama and a top 100 entrepreneur under the age of 35 by the United Nations. Follow his blog for amazing tips on marketing and growing your business. Do follow Neil on Twitter for some amazing advice on bloggin, SEO, and everything marketing! One of the best marketing gurus of our time, Seth Godin is a world-renowned author, internet entrepreneur and speaker. He’s the founder of Yoyodyne, a direct marketing platform which was acquired by Yahoo! for around $30 million in 1998 and became Yahoo’s vice president of direct marketing. Impressive, right?!. In addition to launching one of the most popular blogs in the world, Seth has written 18 best-selling books, including Go Make Something Happen, Tribes, 5 Ways to Grow your Market, Purple Cow, and Tribes. Follow him on social media to get actionable advice like this one below! If you are looking for influencers in the SaaS space, who better than the founder of one of the biggest cloud computing enterprise of our time? One of the pioneers of cloud computing, Benioff is the founder and CEO of Salesforce. Benioff has long been an advocate of the software as a service model and knew that it would eventually replace traditional enterprise software distribution. He is also the creator of the term “platform as a service”. An angel investor in dozens of startups, Benioff is also the author of three books, including the national best-seller, Behind the Cloud. He tweets frequently on all things SaaS related. Employee #30 at Facebook (woah!) and #4 at Mint, Noah Kagan is the Co-founder of AppSumo, a daily deals website for software and online services. Having created four multi-million dollars businesses, Noah’s latest obsession is Sumo.com, a website that provides tools to grow your business quickly. Kagan also writes www.okdork.com which provides actionable advice to entrepreneurs and businessmen. No one is EVER self made. ALWAYS a team. Lincoln Murphy is a well known SaaS marketing thought leader and growth hacker. He currently works at Sixteen Ventures, a management consulting firm which specializes in helping grow SaaS companies. You can find his brilliant work on Sixteen Ventures, including his amazing ebook- ‘Customer Success: The Definitive Guide’. A serial entrepreneur turned VC, David currently works at Matrix Partners — after having founded four companies- Skok Systems, Corporate Software Europe, Watermark Software, and SilverStream Software. He currently serves on the boards of Atomist, CloudBees, Digium, Meteor, Namely HR, Salsify, and Zaius and writes for an amazing website- forentrepreneurs, which was ranked at #2 on Forbes list of the 100 best websites for entrepreneurs. Saying “he knows what he’s talking about” would be an understatement! Mamoon is Co-Founder and General Partner at Social+Capital VC and is a board director of an impressive list of SaaS companies which include Intercom and Slack! He previously had worked at U.S. Venture Partners (USVP) in 2005, where he led early-stage investments in startups such as Yammer (which Microsoft acquired for $1.2 billion in 2012) and Box (currently worth well over a billion dollars). Forbes listed him on its Midas List of top tech investors in four consecutive years. In 2017, he ranked No. 76 among the Top 100 VCs by Electronics Weekly and No. 61 among the Top 100 Venture Capitalists named by The New York Times and CB Insights. Needless to say, his tweets are definitely worth following. Great design is a prerequisite for any product or service. It’s amazing how much knowledge is around us that we can soak up on the internet. If you aren’t already, follow these great thinkers and get inspired to do great things in the SaaS space. Do you follow any SaaS influencer that wasn’t on the list? Do mention them in the comments below.